Another interesting develpment is Google’s plan to offer its own ebooks, “Google Editions” later this summer. An article in toay’s Business Section of the NY Times reports on a deal Google has entered with the American Bookseller’s Association. 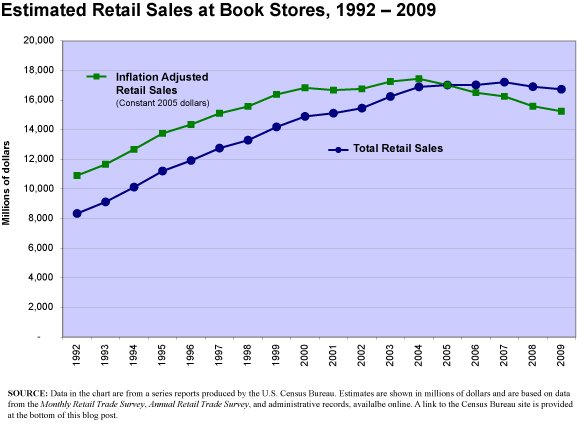 You might find that of interest in researching the book selling business. Thanks for the heads up on this article! It certainly explains the ever-growing shelf space devoted to gift wrapping, DVDs, calendars, etc. at Borders, and the ever-shrinking shelf space devoted to books. So true. I should also have mentioned, in the post, that University Book Stores are a big part of the book store universe and we all remember how many other things they stock. 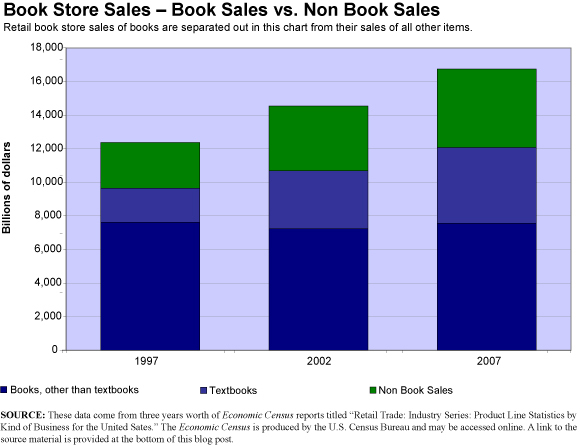 That also explains, to some extent, why text books have been such a growing part of the book store sales profile, as non achademic book stores decline and the university stores grow as a portion of the industry.